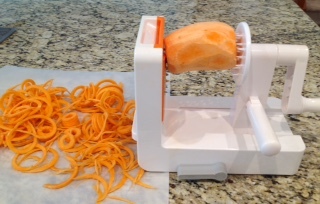 I’ve been on a spiralizing frenzy ever since I received my new ‘toy’ last week. So far, I’ve experimented with zucchini, carrots, and now, sweet potatoes. The sweet potatoes were a big hit as a side dish with roasted turkey breast and gravy, cranberry sauce, and peas. Sounds like a Thanksgiving meal, doesn’t it? But, this was a mid-week, early August dinner for two! I scrubbed 2 medium-sized sweet potatoes under cool running water, patted them dry, then peeled. 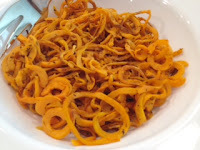 Spiralized the potatoes with my new gadget and placed them in a large mixing bowl. Added a splash of olive oil, a sprinkle of salt and pepper, and a tsp. or so of Herbes de’ Provence, a French blend. (Note: an Italian seasoning blend would work well, too.) Tossed to coat. Lightly oiled a large baking pan with one-inch sides. Spread the sweet potatoes in a single layer. Placed tray on a rack set in the center of the oven and roasted for 15 to 20 minutes. 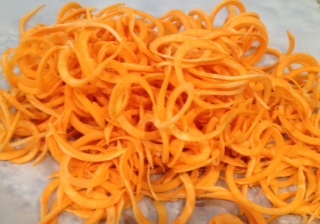 Before serving, a garnish of chopped parsley can be added. It was that easy; now, come on, you try!